Reference number for this case: 8-Dec-54-Marsannay-La-Côte. Thank you for including this reference number in any correspondence with me regarding this case. An Anglophone catalogue of the web towards 2008 indicated that there was a UFO sighting by a single witness on December 8, 1954, between Marsannay-la-Côte and Velars-sur-Ouche, of one unidentified flying object whose aspect and behavior "most likely would have a conventional explanation." "Jacques Vallée" is indicated as the source. An also recent German catalogue does not give any information other than the date and the city, except that it was an observation of the "nocturnal light" type. 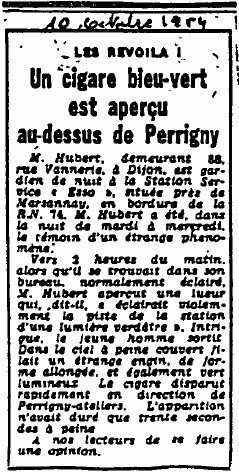 But later I found a copy of an article from some unknown French newspaper for December 10, 1954, telling that a young man, Mr. Hubert, residing at 58, rue Vannerie, in Dijon, night guard at the Esso Gas Station near Marsannay on the R.N. 74 in the night from Tuesday 7 to Wednesday 8 December 1954, at about 2 a.m., while he was in his normally illuminated office, perceived a gleam which, he said, had lighted the track of the station with a greenish light. Intrigued, he went outside, and saw in the barely covered sky a strange flying "craft", elongated and also bright green". The "cigar" disappeared quickly in the direction of Perrigny-ateliers. The sighting had lasted only thirty seconds. In 2018, thanks to a 1982 catalogue by the ufology group ADRUP, I identified the unknown newspaper as Le Bien Public of Dijon. Mr. Hubert, residing at 58, rue Vannerie, in Dijon, is a night guard at the Esso Gas Station, near Marsannay, on the R.N. 74. Mr. Hubert was in the night from Tuesday to Wednesday, the witness of a strange phenomenon. At about two o'clock in the morning, while he was in his normally illuminated office, Mr. Hubert perceived a gleam which, he said, had lighted the track of the station with a greenish light. Intrigued, the young man went outside. In the barely covered sky flew a strange machine, elongated and also bright green. The cigar disappeared quickly in the direction of Perrigny-ateliers. The apparition had lasted only thirty seconds. It is up to our readers to form an opinion. Mr. Hubert, residing at 88, rue Vannerie in Dijon, is a night watchman at the Esso petrol station, located near Marsannay, on the edge of the RN 74. He was, on the night of Tuesday to Wednesday, the witness of a strange phenomenon, around 2 a.m., while he was in his office, normally lit. Mr. Hubert perceived a gleam which, he says, "violently illuminated the runway of the station with a greenish light." Intrigued, the young man went out. In the sky barely covered, a strange machine was racing, elongated and also bright green. The cigar disappeared quickly towards Perrigny workshops. The apparition lasted only 30 seconds. We will let our readers make their own opinion. The witness observed a greenish glow that violently illuminated the runway of the gas station of which he was the guardian. In the sky barely covered, springs a strange machine, elongated and also bright green. The website indicates that on 8 December 1954 between Marsannay-La-Cote and "Velars.Ouche", Marsannay-La-Cote, France, "An unidentified object was sighted, but with appearance and behavior that most likely would have a conventional explanation. One object was observed by one witness." In the Dijon country, between Marsannay-la-Côte and Velars-sur-Ouche, the distance in straight line is of approximately 8 kilometers. 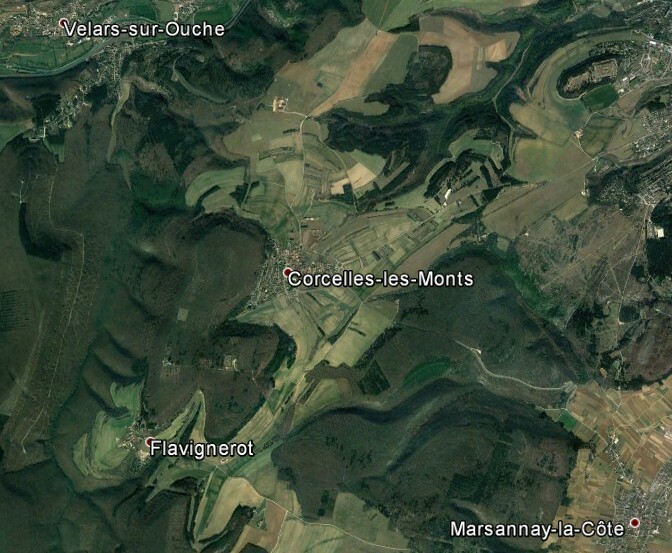 The villages of Corcelles-les-Monts and Flavignerot are located there. [ud1] indicates Vallée is the source, but I did not find any trace of this observation in this author's books; I must miss one of his writings or listings. [ud1] indicates a very probable commonplace explanation. This source does not indicate an hour but [ub1] makes think that it occurred in the night. When I found the newspaper source [pr1], it became quite clear that this was probably a meteor. The Esso gas station obviously no longer exists and several places might have been its location. So it is no longer possible to find a sure trajectory for the object. Nevertheless, the witness being on the R.N. 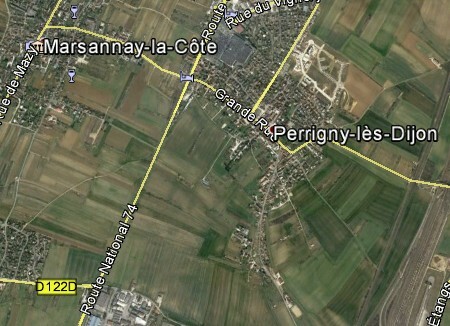 74 and the object going towards Perrigny-ateliers, it had to go from East to West rather than West to East. I might also suggest that Velars-sur-Ouche, mentionned by [ud1] as part of the observation place name could be another sighting of the same phenomenon, or the direction of arrival of the phenomenon, in the West or North-Est. This would result in a trajectory approximately North-West to South-East. [bp1] Article in the regional newspaper Le Bien Public, Dijon, France, December 10, 1954. [vi1] Catalogue in the ufology bulletin Vimana 21, of the ufology group A.D.R.U.P., Dijon, France, #10-11, special issue 54, page 35, 3rd quarter 1982. [vi2] Catalogue in the ufology bulletin Vimana 21, of the ufology group A.D.R.U.P., Dijon, France, #17, page 20, 4th quarter 1984. 1.1 Patrick Gross November 2, 2016 Addition [ub1]. 1.2 Patrick Gross December 20, 2016 Addition of the Summary. Explanations changed, were "Not looked for yet". 1.3 Patrick Gross January 3, 2017 Addition [pr1]. In the Summary, addition of the paragraphs at "But later..." In the Explanations, removal of "Totally insufficient information." 1.4 Patrick Gross December 11, 2018 [pr1] "unknown newspaper" completed and changed to [bp1]. Additions [vi1], [vi2].